Hello, everyone! 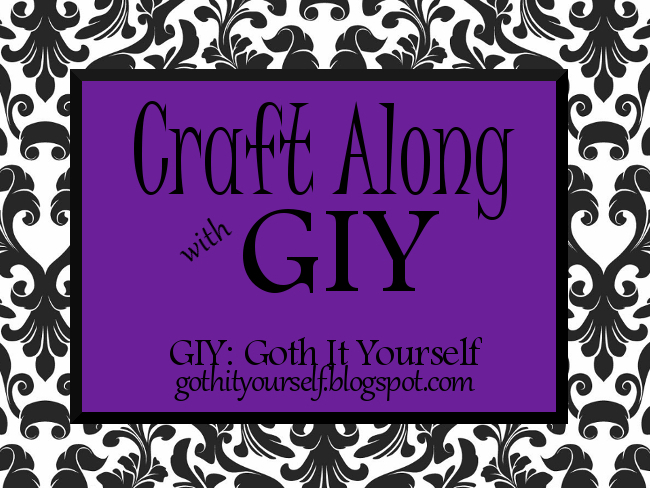 I am so looking forward to the first Craft Along with GIY post! :) The theme for January is Pets. Tomorrow, January 29, I will post my completed project. You can leave your comments and links on that post. Late on January 31, I will compile the links on the new Craft Along with GIY page. Now I'd better get busy finishing up my project. It's almost done! The room I'm currently focusing on is my workroom (where I hung the patchwork curtains). I just have one project left to complete the room, and then it's on to the next - my walk-in closet. In a case of fortuitous timing, Arhaus contacted me to see if I wanted to write a post about what I'd have in my dream dressing room. Though I certainly like to dream big on occasion, I can't help looking at things from a practical perspective. And with GIY’s emphasis on thrifty décor and DIY projects, it makes sense to post about creating a nice dressing room on a reasonable budget. So what does one need for a nice dressing room/area? I think the basic requirements are storage, lighting, and a mirror. If you include hairstyling as part of dressing, you may also need an electrical outlet for hair dryer and/or styling tools. Many people dry and style their hair in the bathroom; however, that’s not a good option for me because my bathroom is tiny, has no counter space, and has only one electrical outlet in a horribly inconvenient place. Trying to do my hair there would be a challenge. I set up a hair (and makeup) area in the spare bedroom instead. Thus, I actually have two dressing rooms/areas: one for clothes and one for hair and makeup. Both areas have been/are being set up on a low budget. For hair and makeup, a chest of drawers functions as both work surface and storage. I chose a chest of drawers because I’m tall, and the height is more convenient than a dresser or table. The chest was a secondhand find that I painted. I use a large glass cutting board to protect the top of the chest. It withstands the heat from my curling and straightening irons. My hair accessories fit nicely into the drawers, organized into some inexpensive bins/drawer dividers I found at Jo-Ann and Big Lots. The mirror was purchased for 90% off because it was damaged - the bottom fleur-de-lis was slightly bent. But it's made of metal, so all I had to do was bend it back. So I got a perfectly good, new $60 mirror for $6. :) I planned to paint it black (of course), but I found that I liked the bronze color when it was paired with the wallpaper and faux tin ceiling in the room. Light is provided by two tall lamps on either side of the chest of drawers. Though they function well, they are rather plain. I want to replace them with nicer, more decorative lamps. I've picked out a few candidates (shown below). 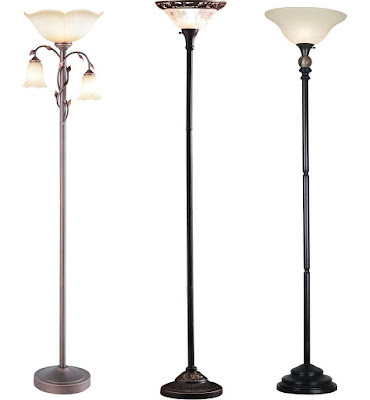 I like the one on the left, but I'm not sure if the 3-light style would work well. I'll probably go with the one in the middle; it's a dark bronze finish that matches the mirror. For clothes, I am fortunate to have a walk-in closet that is large enough to function as a dressing room. (Mirror is covered to avoid flash reflection.) It's a bit incongruous in my small house but was certainly a selling point for me! I added an IKEA chest of drawers for tights, leggings, and the like. It's one of the few items I purchased at retail, but of course, IKEA is very reasonably priced. It provides three enormous drawers while still being short enough to sit under the hanging clothes. It’s plain white; I think I will add some decals as I did with my bathroom vanity. The standing mirror is from a thrift shop. It fits perfectly at the end of the closet, but it needs some GIYing. I’ll at least paint the frame black. Light is provided by the least glamorous light fixture one could have – a socket with a bare bulb. The plastic shade which clips directly on the bulb reduces the glare but does little to improve the aesthetic. 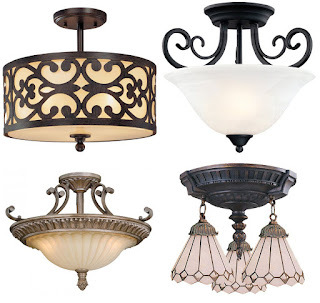 I will definitely be replacing the light fixture. I’d love a black crystal chandelier to match the one in my bedroom, but it would hang down too low. I’ll need to get a semi-flushmount fixture instead. I haven't seen many at thrift stores, so I'll likely have to wade through the enormous variety of retail options (some shown below). I like the drum shade on the top left, but the fabric is beige, which would make the light too warm for my taste. The fixture on the top right is what I have in my dining room. I appreciate Arhaus providing the inspiration to write about this topic. It gave me a good reason to try some project planning “out loud” instead of planning everything in my head and then later posting the final result. Are you interested in mood board/idea type posts where I write about what I'm considering and show what I might do (and welcome feedback, as always)? Or do you prefer to simply see the completed project? Hello, everyone! Just checking in with an update/reminder on the January craft-along. I'm making dog beds out of secondhand end tables. I have them primed and painted black. I had planned to finish them this weekend, but instead I have spent the last 36 hours enduring the worst headache in recent memory. I desperately hope to be better by tomorrow because I have a lot happening at work this week. Luckily, we're only halfway through January, so I still have plenty of time to finish. I will post the completed project on the 31st. 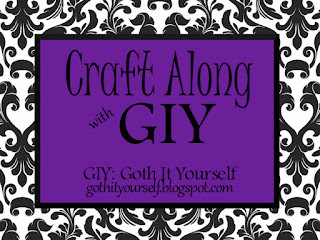 Yesterday I began working on my Craft Along with GIY project. I am making dog beds out of end tables. The first step was to apply a coat of primer. Just as I was finishing the second table, sharp pain shot through my lower back. I could barely stand up. I had hurt my back painting. Wow. I am in such poor shape, I hurt my back sitting on the floor painting. I once read an article by a man who stated that a person's life expectancy is directly correlated to how easily he/she can rise up from sitting on the floor. If that's true, I think I have about two weeks to live. Seriously... I am horribly unfit. This incident motivates me even more to improve my diet and exercise. I have decided on a plan of action to help me overcome the obstacles (aka excuses). My hurdles/excuses for exercise are I dislike gyms and I hate being outside in the sun. To overcome those, I will work out at home. As a starting point, I have purchased an exercise bike. My hurdle for diet is I hate to cook. For me, cooking is far more trouble than it's worth, and the result is terrible no matter how hard I try. So I end up eating frozen pizza and fast food. In an effort to improve my diet, I'm going to try a meal delivery service. Hopefully, I can discipline myself to stick to the plan. I never again want to be in this absurd situation of having to nurse a painting injury. I recently ordered new glasses from Zenni Optical. It might seem odd to buy glasses without trying them on, but the Zenni site allows you to upload a photo of yourself and virtually try on glasses that way. It also has a selection of faces available, and conveniently, one of them resembles me - dark hair with bangs - enough that I didn't upload my photo. I already had a good idea of what styles work for me anyway, as I've been wearing glasses for many years. My main challenge is finding frames that aren't too wide for my narrow face. I determined the width of my existing glasses and used that to choose frames. One frame is a black metal half-rim with decorative temples. I'd never had half-rim glasses before, but I think I like them. They're pretty simple from the front, but have a nice decorative design on the sides. The other frame is a black metal full-rim with an interesting shape. In general, I like them, though I wish the lenses were just a bit taller. Zenni's selection of styles is extensive, and even better, easy to search based on color and size. However, I was initially pretty skeptical because their prices are so low. Their frames are generally less than $30, which includes the lenses. Frames at retail optical shops are easily $200+. But after receiving my glasses, I have nothing but the highest praise. My order arrived quickly, and the lenses are precisely correct.